A discovery in the abandoned Panama Hotel in Seattle sparks the memories of Henry Lee, a man who recently lost his wife to cancer. She is not his first love though. The hotel hid the possessions of Japanese Americans sent to interment camps during World War II, including the belonging of a beautiful girl named Keiko. Henry, a Chinese American, and Keiko were the only children of Asian descent at the distinguished Rainer Elementary School. The twelve year olds were bullied mercilessly by an older boy, Chaz Preston. Finding that there's safety in numbers, Henry and Keiko stick close together to avoid getting beaten up. At first, Henry is hesitant to become friends with Keiko. His father hates the Japanese with a passion and teaches Henry to see them as the enemy. Henry soon learns that Keiko is as American as apple pie and even loves jazz as much as he does. As the war progresses, Henry and Keiko's friendship grows until she and her family are taken away. Henry defies his father and with the help of the lunch lady, Mrs Beatty, gets a job as a cook at the camp where Keiko is interred. Time is running out for this budding romance as Keiko's family is to be moved to a more permanent location far from Henry. They make a promise to be together no matter how long it takes, but due to time and circumstances, it never happens. Henry goes on to have a happy life with his wife Ethel and their son Marty, until her death. His relationship with his son becomes strained while his wife was ill and he is shocked to learn that his son sees him as a man much like his own father. If he only knew, why the old jazz album hidden in the basement of the Panama Hotel is so important to Henry. 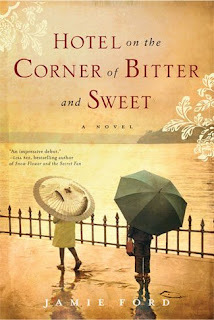 I had my ups and downs with Hotel on the Corner of Bitter and Sweet by Jamie Ford. It was a bit like learning to drive stick. A smooth start, a jerk and a stall, and then you get the hang of it. Just when I got into it, I lost interest only to find it again later. I'm not sure if it was the jump from the 40's to the 80's or more about style of the writing. I also wondered about Henry and Keiko's age. At 12, I had no interest in boys so I can't image falling madly in love enough to make promises of devotion. I wonder why Ford chose that particular age. I'm sure he has his reasons. The story itself is quite interesting once I got past those issues. Hotel takes a personal look at what the Japanese Americans went through during the war. Image having your home taken from you, having to either hide or sell all your possessions, having to prove your patriotism over and over again, and leave your life behind not knowing if you'd ever be back again, just because of your ancestry. Although Henry is fictional, the Panama Hotel is not. It is a physical reminder of the suffering of these families during a terrible period of history. I liked quite a few of the characters especially Sheldon the sax player and Mrs Beatty (she was a surprise). They had a depth to them. Keiko was a darling. I liked older Henry more than younger Henry. I guess he aged well. I also thought the story ended right where it should. Very nice. Despite a few iffy spots, I recommend Hotel on the Corner of Bitter and Sweet. This book provided as part of a Pump Up Your Book Promotion Tour. Thanks! I've heard great things about this book, but I'm glad you mentioned some of your issues with it. Thanks for the review. Great review Christina. I really liked how you explained your "ups and downs". This book is on my TBR. I can't decide if I want to read this or not. I might wait and see if the library gets it! Hmm... I'm interested in the setting / history of this story. Maybe more so than the key characters. I did think the characters were a little young, but thinking back on it, I definitely liked boys when I was 12 and I had a boy that liked me in fifth grade. It isn't the same as love now, of course, but I don't think it's impossible. I'm drawing a complete blank on who Mrs. Beatty was--was she the lunch lady? I liked this one, too, but not as much as everyone else seems to. The time changes didn't bother, but there was just something...? S.- I think the positives outweigh the negatives. Teddy- lol Thanks! I didn't know how else to explain it. Texas- It's definitely an interesting part of history. Meghan- Crushes, maybe, but not quite that intense. Trish- Yes, the lunch lady. Yeah, I know what you mean. It's hard to put a finger on it. I'm looking forward to reading this. Thanks for the warning about the iffy spots. This sounds like an interesting book. Now I'm curious how things work out between Henry and his son. Will have to read it and find out. This book keeps not quite making it to the top of my pile, there's always something else I want or need to read, but it doesn't slip down to the bottom either. Your review gives me a little more information to consider next time I think about it. I'm reading this book at the moment and loving it. No stalling for me at all. The thing that I find remarkable about it is Ford's descriptive language when handling emotion. It's so spot on and quote-able. He encapsulates even very difficult emotions with beautiful imagery. Rare to find that in a male author. Thanks for the honest assessment. I'll be reading this for a TLC tour in January, and I'm looking forward to it. I hope it's okay that I linked to your review on War Through the Generations.